Intern(al) Thoughts: A "Riverfest" Success! I, Emily Lindholm, am so pleased that I can FINALLY say those four glorious words: Riverfest 2012 was fantastic. I wish to shout it from the rooftops, sing it through the streets, and write about it all day long (one out of three isn't bad, right?). Jokes aside, I am thrilled with how our Saturday went, and couldn't have been in better company. Throughout the day we had people working the booth from a bleary-eyed 6:45am all the way to 5pm, dedicated to getting the word out that our theater on 5th and Main Street is a site to not just to be seen, but to be loved and--mark my words--it will love you back. The most exciting thing for myself was that our booth looks nothing like it did last year. With our new logo, and new color scheme, it was time to make the transition-- starting with some sassy black lattuce, costumes on display, new graphics for all shows and concerts, and the chance to win two free tickets to our upcoming season--so exciting! Over the course of 9 hours we had an astonishing 600+ entries to win our tickets, along with tons of enthusiastic individuals who signed up to be added to our mailing list. 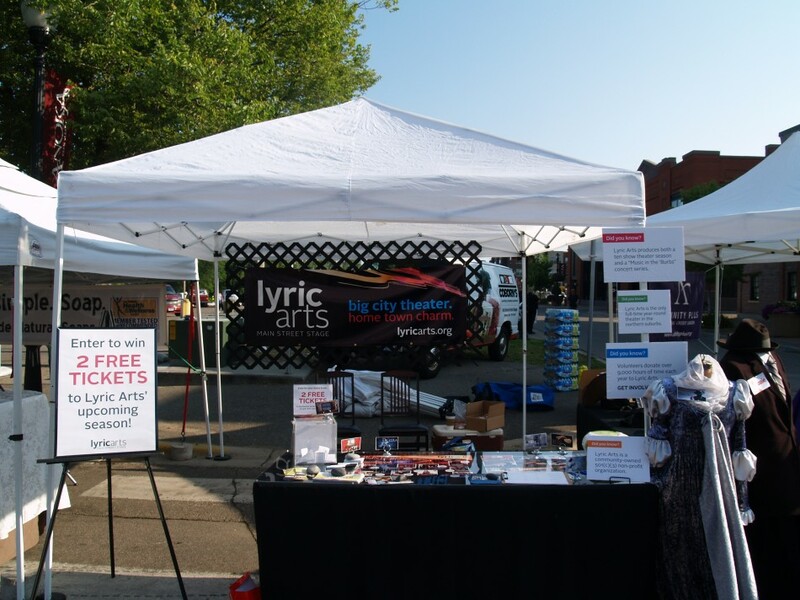 While I admit that I sometimes turned the questions over to my fellow booth-mates, I was proud to be able to talk to people about Lyric Arts, spread the word about all the exciting details of next season. Along with that, it was fun to hang out with all my newfound friends here at the office--when you are in a booth in 92 degree heat for 5+ hours, things get goofy and some serious fun was had. In the following weeks, I'll be dedicated to getting back to business at wrapping up the social media fact pages and fun publicity content for 2012-2013, as well as writing the templates for all the press releases that will be sent out over the course of the season. Not to mention I'll be at Cabaret this Friday AND Saturday because--let's be honest--once is just not enough! Check out the rest of the pictures from Riverfest right here! Is there anything better than a nicely scheduled day? 9:30AM: Arrive at work--all is quiet. 11:06AM: Remember "Riverfest" meeting when kindly reminded that I was the one who scheduled it. 1:55PM: Celebrate the finished "promo" with a quick trip to Truffles & Tortes for a sandwich to go! 2:00PM: Get very sweaty on the steamy three block walk down Main Street. 2:35PM: Snag a peak of the "Kit Kat Klub" sign being installed onstage! 3:00PM: Send emails, make lists, contemplate getting a haircut. 3:26PM: Decide to be productive again and write this weeks "intern blog"
3:31PM: Arrive at the conclusion that a summary of my day would be the perfect entry. 3:45PM: Finish blog, watch my seating promo one last time, admire my press release that made abc newspapers today, post Noises Off audition information, and wrap everything up in time to beat the traffic back over to Champlin to start the weekend. If you didn't happen to catch the seating promotion posted on Facebook today, check it out here. The Master of Ceremonies has some important information for you! Cabaret opens in one week! We have the golden tickets! Actually they are red and gold. And in German. Isn't it cool? We think so! In other news, this week has been pretty darn crazy. We've been getting ready for the 2012-2013 Concert Series announcements (the official list just went up this morning!!! ), hanging out with the talented kids in our summer workshops, getting fundraising letters in the mail, preparing for the Season Subscriber event on June 20th, and many, MANY other things. I'm currently working on putting together a series of interviews for a Cabaret promotional video. It's going to star the artistic staff who is in the process of making this one of the most outstanding and unique shows this season, and it has been a blast learning more about their jobs! Two nights ago I had the pleasure of interviewing Cassandra--one of the dramaturgs for this production-- about the historical context of the show and she was brimming with information. For example, did you know that by time Cabaret takes place (at the start of 1930s) the Germans were using reichmark notes--that's like our dollar bills--to paper their walls because it was cheaper than buying real wallpaper? Thanks to Cassandra, now you know! Keep an eye out for more interesting facts--they're coming your way! Act I. Scene I The stage is dark. All is silent. Out of the darkness comes the sound of a single person... Typing. Very fast typing. More join in. The sound seems to surround the audience with its intensity. The chorus of typing is now joined by the quiet, yet powerful tunes of Whitney Houston, accompanied by a sudden case of the giggles offstage. The smell of a well-cooked bagel sandwich sends its sweet, cheesy aroma wafting around the room. The lights come on. The audience is DAZZLED by a spectacular amount of purple on the walls, paintings on the walls, and twinkle lights on the ceiling. Everyone is immediately engaged by the resonate charisma of the actors, now sharing a hefty case of eye-watering chuckles. It is clear that the setting is none other than Lyric Arts, one of best (and most fun) theaters this side of the Mississippi. The director yells "Annnnnd ACTION!" Hi! I'm Emily, this year's Lyric Arts summer intern, and this is the show of my theatrical life, or... my life as a theatrical show? I don't know. Anywho, this is my second day here at Lyric Arts, and I'm THRILLED to be able to start my very own summer intern blog. To begin, I'll share a little about myself. I'm a rising senior at Gettysburg College in the process of earning a degree in Sociology and Peace & Justice Studies, as well as a secret degree in "theater enthusiasm." I'm here this summer to delve into all things theater-related, from publicity, to production, to development, to achieve the goal of better understanding how a theater operates, especially one that is a non-profit organization. I'll be here Wednesdays through Fridays this summer to keep you updated on all Lyric Arts-related news, as well as keeping you privy to some ultra-special, totally cool behind-the-scenes updates as we work towards the opening of Heaven Can Wait on JUNE 1ST (grab those tickets!! ), the commencement of our summer workshops, Riverfest, and the long-awaited opening of one of my favorite shows ever -- Cabaret -- on July 13.